Dale Fastener Supply proudly manufactures and distributes square u-bolts in 304 stainless steel. 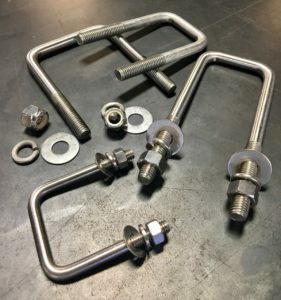 Whether you need square u-bolts in a custom or standard size, we can help. Most of our customers order square u-bolts for their superior corrosion resistance in saltwater applications such as boat trailers, lifts, and docks. Other common marine applications include boathouses and docks and bulkheads. In addition to marine applications, our customers also use square u-bolts for heavy equipment projects. We offer same-day shipping for stock u-bolts and offer short lead times for custom products. In addition to our stock 304 stainless steel u-bolts, we also manufacture custom carbon steel, A193 B7 4140, and 316 SST square u-bolts, with a variety of finishes. Most commonly Hot Dip Galvanized, Zinc Plated, and Pro-Coat. All u-bolts are manufactured at our facility in Houston, Texas, so we are able to offer short lead times and competitive pricing. To order custom products, please request a quote today.